This month?s speaker is our own, Tony Davis. 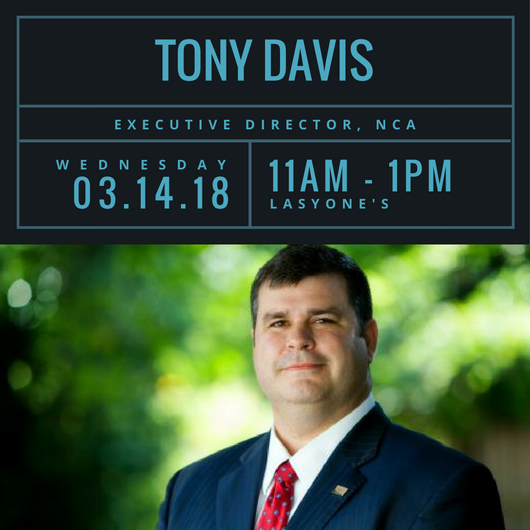 Previously the President of the Natchitoches Chamber of Commerce and currently the Executive Director at the Natchitoches Community Alliance Foundation, he coordinates workforce training, site development, marketing and planning for economic development for Natchitoches Parish. He is a native of Natchitoches, Louisiana, and graduate of Northwestern State University where he received his B.S. in Business Administration. Currently, he serves on the Board of Directors for the Norwela Council of Boy Scouts of America, the North Louisiana Economic Partnership, and the Central Louisiana Economic Development Alliance. Mr. Davis also serves on Advisory Councils for Northwestern State University, and the Central Louisiana Technical Community College. Additionally, he is an active member of the Louisiana Industrial Development Executives Association. He has previously served on the Board of Directors for the Louisiana Association of Business and Industry, the Center for Chamber of Commerce Excellence, and the Louisiana Chamber of Commerce Executives, which he chaired in 2014. He is a graduate of Leadership Louisiana and an elected member of the Board of Elementary and Secondary Education, or ?BESE?, setting policy for the more than 700,000 students in the preK-12 system. He is married to the former Amy Marquart of Crowley and they have two children.